As I drove through the Maryland woods to old Fort Frederick, it was hard to believe that Col. George Washington once called this beautiful and tranquil scene a “theater of bloodshed and cruelty." Hoping to photograph the massive stone fort that Saturday morning in the golden light of dawn, I snuck past a sign saying the park would not open until 8:00. The sun was just coming up, painting a golden edge on dark gray clouds that moved rapidly across a deep blue sky. If I were caught trespassing, I hoped the ranger would sympathize with my good intentions. 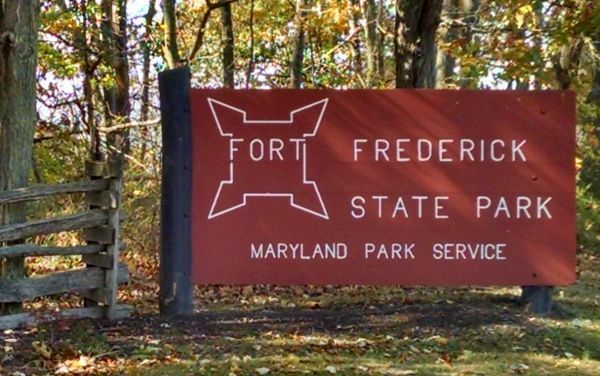 Fort Frederick sits only a mile from busy Interstate 70, above the Potomac River in the mountains west of Hagerstown, Maryland. Even though it embodies so much history, the fort is well off the path of most travelers. The Maryland Colonial government built massive Fort Frederick in 1756 to protect its Western frontier from bloody French and Indian attacks. 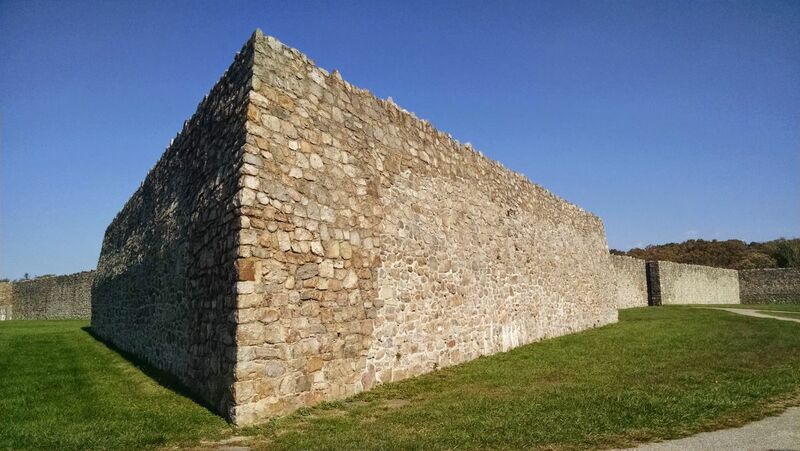 Erected in 1756 at the beginning of the French and Indian War, Fort Frederick is the best-preserved English stone fortification in the original Thirteen Colonies dating from before the Revolutionary War. (Castillo de San Marcos in St. Augustine, Florida, was built by the Spanish and Fort Ticonderoga in New York was originally French.) It was the cornerstone of Maryland’s defense against French and Indian attacks coming from the west and north. 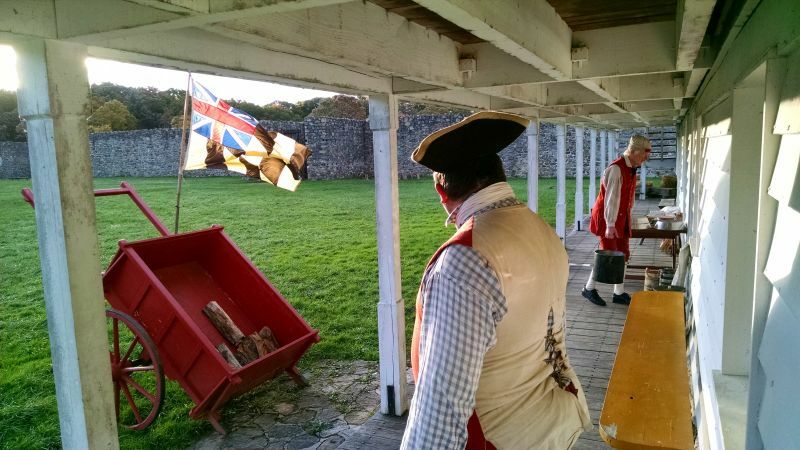 The Maryland Colonial flag still flies at Fort Frederick. I parked my car in the empty lot and walked around the Fort’s ancient stone walls that reached up six feet above my head, looking forward to a few moments of solitude communing with the past. George Washington visited the fort often, and this was the last bastion of civilization that Col. Braddock saw before marching off to his death 160 miles away in the wilderness south of present-day Pittsburgh. After the sudden Indian attacks, “no less than 350 wagons, transporting the affrighted families, passed in the space of three days,” reported George Washington to the governor. As I entered the huge gates with their hand-forged ironwork and thick, weathered wood, I was surprised to see someone already in the fort I thought was closed: a soldier in 18th Century uniform leaning against a wooden column, drinking from a mug and watching the early morning sunlight shining through a Colonial Maryland flag in the courtyard. When I asked what he was doing in the fort so early, Jim Rogers explained he’s a volunteer with the Joshua Beall Company of the Maryland Forces, dedicated to guarding the frontier and helping visitors relive the past. Jim Rogers stands watch on the walls of the old fort. The 1750s were a terrifying time. The frontier was a “theater of bloodshed and cruelty," wrote 24-year-old George Washington to Gov. Dinwiddie of Virginia in the summer of 1756. French and Indians raiding parties had “laid Maryland and Pennsylvania waste, as low as Carlisle.” English settlers “are flying with the utmost consternation” back to the east, he reported on August 5, 1756. 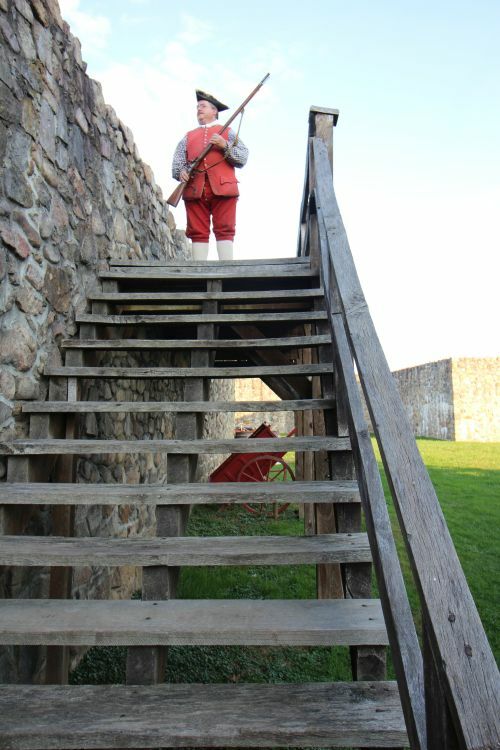 Reenactors at Fort Frederick help rangers interpret the site for visitors. In exchange, they are allowed to spend the night in the historic barracks after the park closes, cooking dinner over the fire and singing bawdy songs by candlelight. I was surprised when Jim invited me in for breakfast. 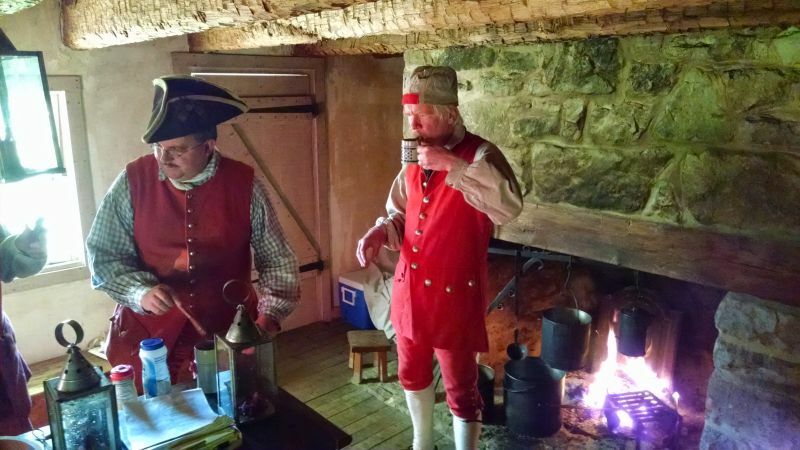 Entering the old barracks, I found a room of five groggy reenactors tending a fire and boiling coffee in an old iron pot hanging over flames in the fireplace. Everyone was already in uniform, except Sgt. Dustan Black, who was still sitting in long johns on the mattress in his hard wooden bunk. Coffee brewed in a pot over an open wood fireplace has a special flavor. We sat at the old wooden table and talked about the old Fort’s heritage, and I learned that the original stone walls are largely original. When the Civilian Conservation Corps restored Fort Frederick during the Depression, they needed to add only a couple of feet of new stone to protect the top of the battlements. They reconstructed some of the wooden barracks and other buildings based on archaeological work. After the ranger left, I ask the men what it is like to actually spend the night in the fort. I could see the authentic wooden bunks were tiny and uncomfortable. One of the soldiers admitted they added some foam rubber. 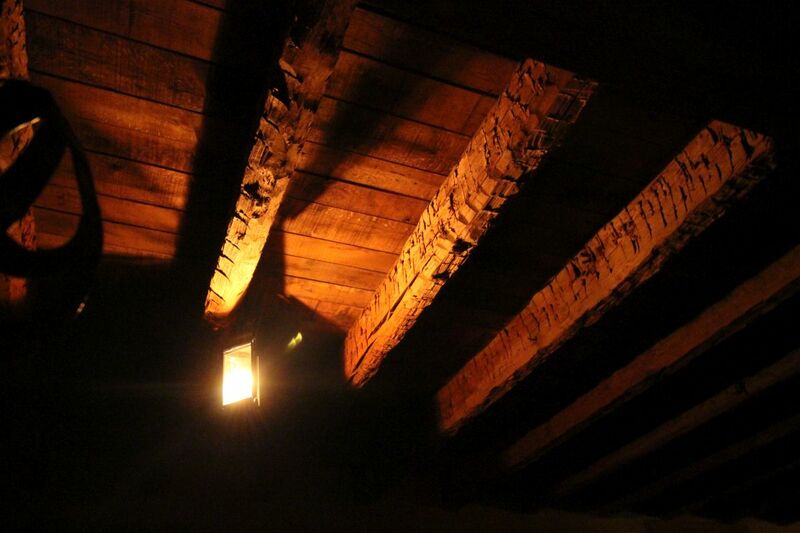 In the old frontier fort that witnessed so much suffering in the 1700s, reenacters sleep in barracks lit only by lanterns. They claim to have heard regularly-paced footsteps in the empty rooms above. But the big question was: Did they hear anything strange, any spirits from those tragic years still lingering around? The commander, Capt. Phil Woodbury, dressed smartly in a bright red officer’s jacket, quickly dismissed the idea of ghosts. But others in his company weren’t so sure. Everyone fell silent at this comment, lost in thought. We all knew the past is still very much with us. 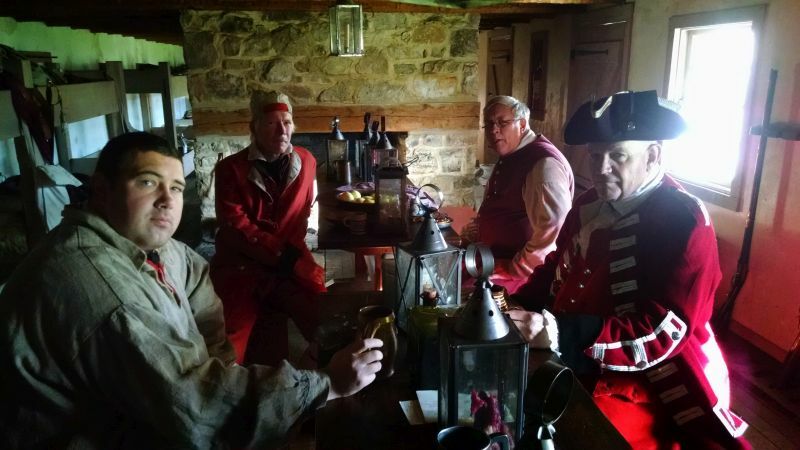 Sitting with these gentlemen in their authentic Colonial uniforms, in this hallowed place with a fire crackling in the old stone fireplace, the past seemed even more alive. 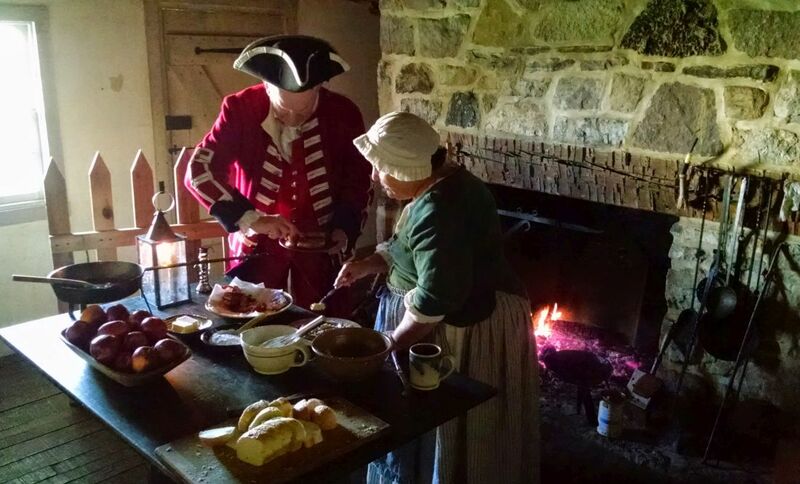 Reenactors are rewarded with a breakfast of country ham and French toast cooked over a fire in the stone hearth. Pvt. Roy Long broke the silence by announcing he was off to get some French toast. We marched across the parade ground to a smoke-filled kitchen where a woman in simple white bonnet fried up bread in an iron skillet over a hardwood fire. Fruit and a stack of thick bacon sat piled up on plates nearby. We were glad to do our part – for the entire weekend, not a single attack from French or Indians was reported. Under our care, the realm was safe. 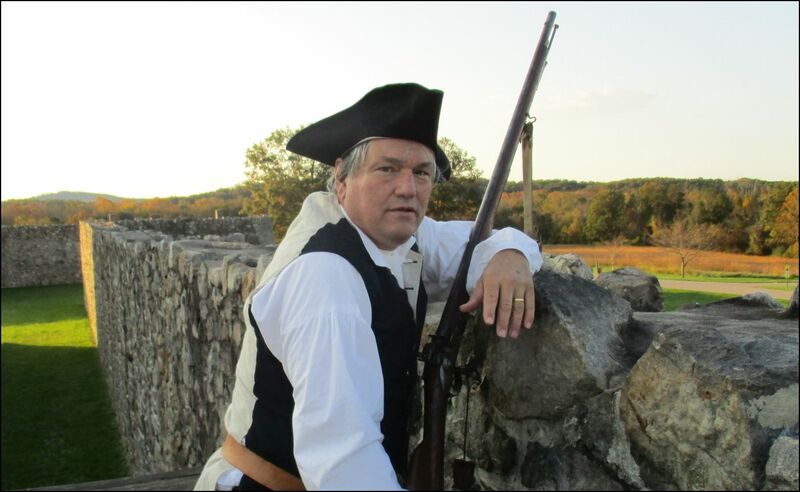 Not a single attack from French and Indian intruders was recorded on the weekend.American Heritage editor Edwin Grosvenor helped guard at Fort Frederick.